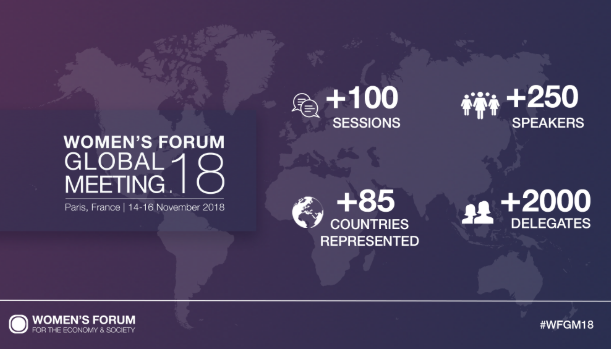 OECD Forum 2018: Women in Tech | The Forum Network, hosted by the OECD: Shape ideas. Shape policy. Shape the Future. During this year’s Forum, a panel of successful tech entrepreneurs and leaders delved into the question of why women are still struggling to make meaningful inroads into the world of tech. The digital transformation is being courted as a game changer for gender equality, but how do we do this while at the moment women are being pushed out of tech careers at twice the rate of men? Susana Balbo, Argentina’s first female winemaker and Chair of the W20, a transnational network of women leaders of civil society, business, entrepreneurship ventures and think-tanks charged with influencing the agenda of the G20, shared the difficulties she encountered in climbing to the top of her profession. Ms. Balbo reported that over the years she worked harder and put in more hours than her male counterparts. She described feeling caught in a “catch-22 situation”: while it was important for her to prove her talent and capabilities, she paid the price by sacrificing time with her family because she could see no alternative. She spoke matter-of-factly about how women, due to the necessity of taking time out to have families, find it much harder than men to progress in their careers. She believed that women who have their own business or are part of a family enterprise find success more easily. Chiara Condi, President and Founder of Led By Her, discussed how her organisation, through education and mentorship, is supporting women who have overcome adversity in their lives by becoming entrepreneurs. Led By Her has created partnerships with companies and business schools to deliver 300-hour courses to women to equip them with the skills to get their own project off the ground. 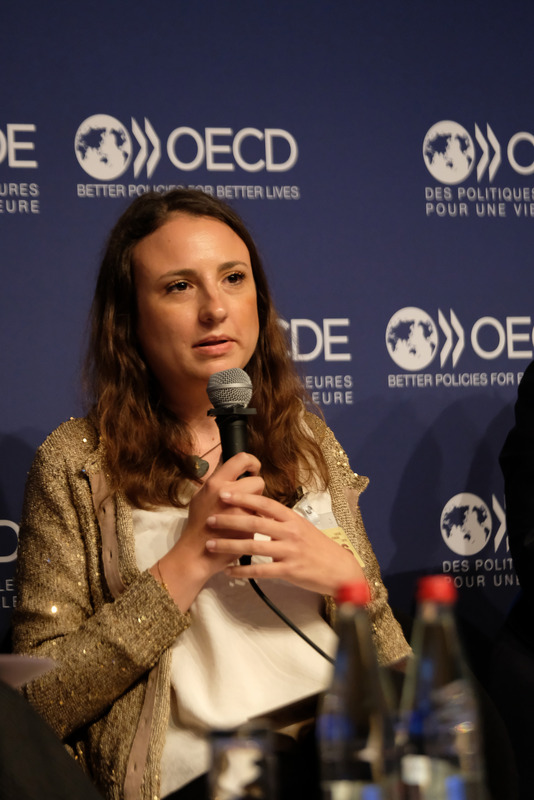 Chiara mentioned that tech companies need to understand that it is not attractive for women to work in male dominated environments, for a lower salary, and less chance for career progression. In the past this kind of discrimination was overt, the difficulty now is that it is hidden, making it more difficult to address. Women’s success cannot just be left to their individual efforts; if they are to be successful company culture needs to change. 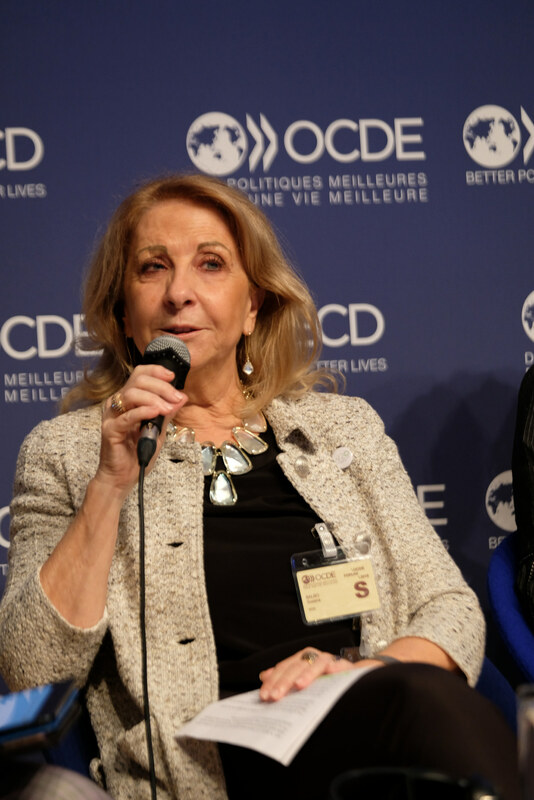 Béatrice Clicq, Confederation Secretary with Force Ouvière, one of France’s biggest workers’ unions, warned that although teleworking is allowing women to balance home and work demands better, it is making women more invisible in the workplace. Furthermore, women are expected to be faced with the brunt of job displacement that the digital transformation will bring. If 65% of new jobs created are in the IT sphere, and other fields heavily dominated by men, we can see that we have a lot of work to do to ensure that women can claim an equal share. Aleph Molinari, Founder of Fondación Proacceso, which works on combatting the digital divide in Mexico by providing training in low-income areas and catalysing economic and social development through technological initiatives, pressed for the need to equip women with basic digital skills to increase their opportunities for work without losing focus on the importance for women to also have access to higher-level skills. If not, women are at risk in the future of again being assigned to limited work roles. 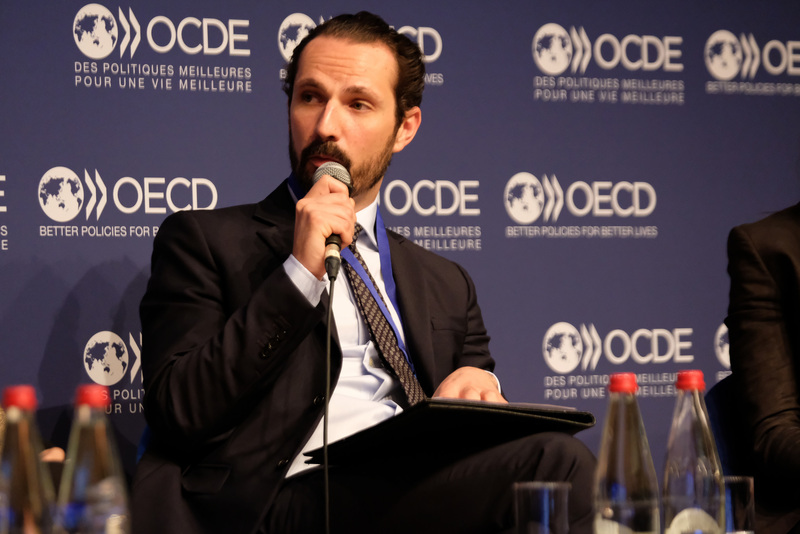 Mr. Molinari discussed the mythology existing around male success in tech careers and suggested that “we need to restructure the narratives of the hero of the successful business man and portray more successful stories of women who became an astronaut, an engineer or a scientist”. 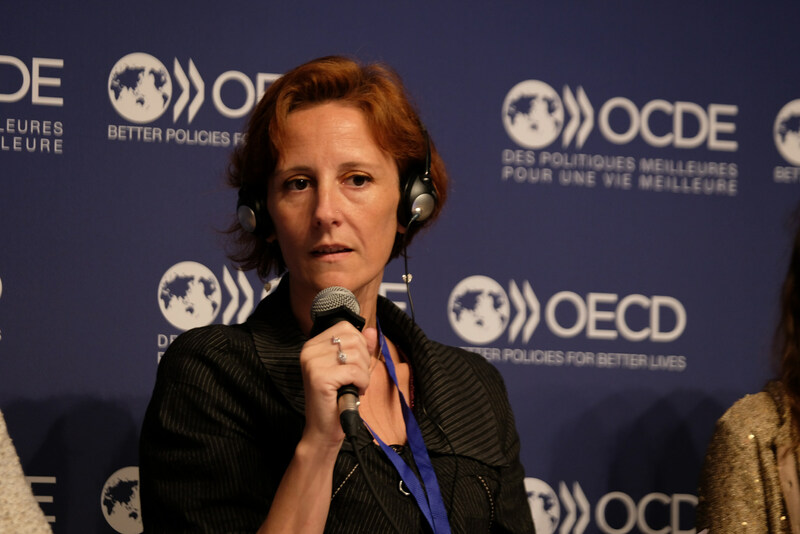 Emmanuelle Quilès, CEO`, Janssen France, identified confidence as key to succeeding: women are less comfortable claiming their authority as experts with the very reverse being true of men. Tarah Wheeler, Principal Security Advisor and Cybersecurity Policy Fellow, New America, responded that women are making a mistake waiting for a third party to refer to them as expert and this is what is impacting their confidence. 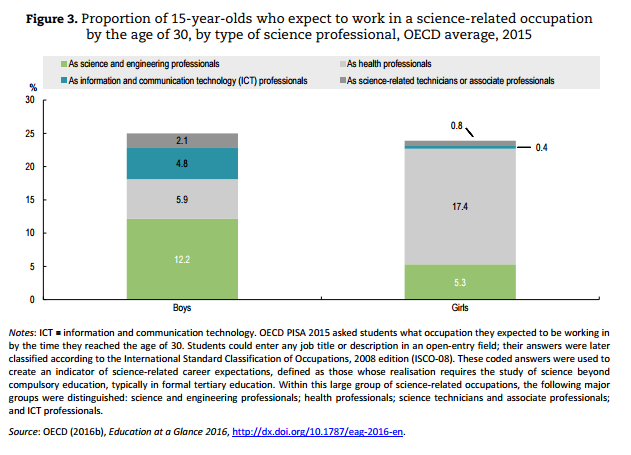 They should not let some-one else be the judge of this: if they are working in tech, they are experts. Men can be a great help by giving women the job title they deserve, and by opening meetings and other opportunities for women to engage with higher level executives. 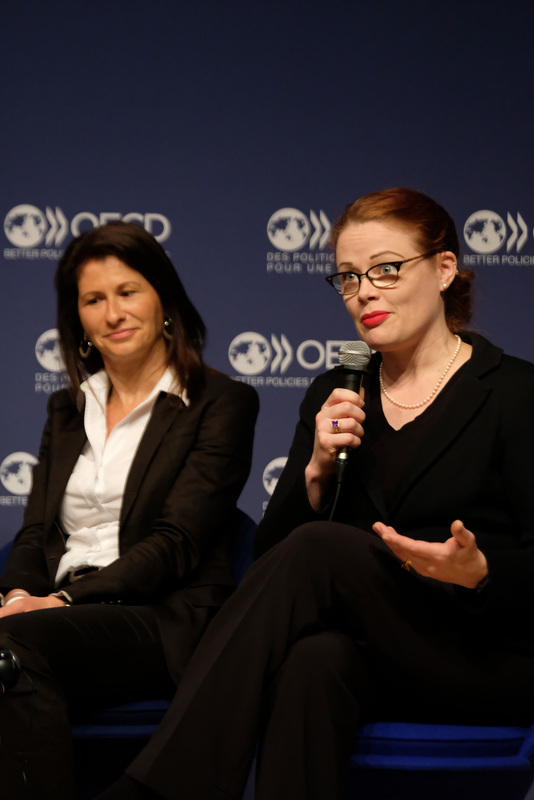 Monika Quiesser, Senior Counsellor and Head of Social Policy Division at the OECD, closed the discussion by highlighting the fact that harassment at work and loss of confidence are linked. Both need to be addressed. She also mentioned that job titles really do matter in terms of building confidence, and that it is very worrying that women who go into tech jobs leave the sector twice as often as men do. that is what MrMolinari discussed “we need to restructure the narratives of the hero of the successful business man and portray more successful stories of women who became an astronaut, an engineer or a scientist”. "that is what MrMolinari discussed “we need to restructure the narratives of the hero of the successful business man and portray more successful stories of women who became an astronaut, an engineer or a scientist”."